Can you feel it? The cooler weather (hopefully! ), the buzz in the stores about school supplies and back-to-school sales… Can you hear it? 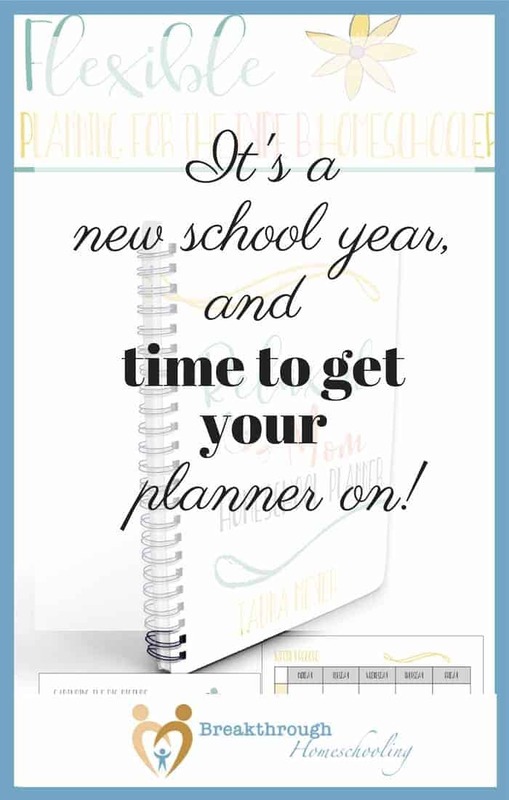 The alarm clocks going off a bit earlier (maybe…), the school bus stopping at the corner at o-dark-thirty… Yup, it’s that time: time to get your planners out and get ready for school, friends!! So whether you’re just getting started homeschooling, or you’re looking to ramp up your game (or perhaps just keeping your head above water! ), let me tell you about a tool you’ll most definitely want in your toolbox! Tell me you’ve sat down and written out all you have to do this year already, right? The kiddos and their curricula, the Sunday School or co-op classes, the piano or painting lessons, the PE classes or tennis lessons, volunteering in the community, family visits, holidays, vacations, perhaps stuff you need to do with your own business or job…the list is endless, isn’t it? And those are just the things that you know about right now! Who knows what is gonna develop down the road? Now tell me you don’t need a planner! So when I first heard about The Relaxed Mom Homeschool Planner, I was a little dubious. But I guess the title grabbed me (not ’cause I AM relaxed…but it IS something I aspire to be! )… And I’m so glad I checked it out! The back contains customizable copies of the pages that are so artistically presented in the first half: Quarterly plans, Weekly routine, Weekly record, Weekly plan, and her 2-page weekly spread with larger boxes. And YOU get to decide what pages you’ll print out, and how many, and where you’ll keep them! These will fit quite nicely inside the binder I use for the kids’ materials each year. So…in with the co-op calendars, and music lesson schedules, and church youth group updates and extra-curricular information, this will help me keep it all organized and sane. I like that her planner not only focuses on the plan, but the “why” behind the plan – vision, priorities, and lessons learned. Character issues and training is included in both goals and quarterly planning. It distinguishes between plans and accomplishments… because sometimes life happens and the two just don’t jive! Our words are powerful! I appreciate the daily prayers and blessings she includes, as well as the Scripture Cards that you can print, cut out and laminate, although I’d love to see even more of those! But the best part of this program, hands down, is the e-course, which walks you through each section. 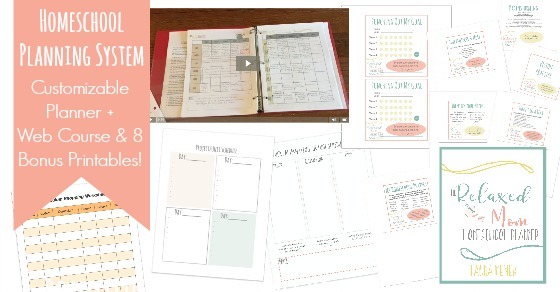 This is a great planner choice for moms who are new to planning, fans of paper-and-pen systems and are looking for a little more substance than “just” a planning tool. The “extras” offered with this product will help your homeschooling efforts have a depth and intentionality that will keep you all engaged and growing as you learn together! 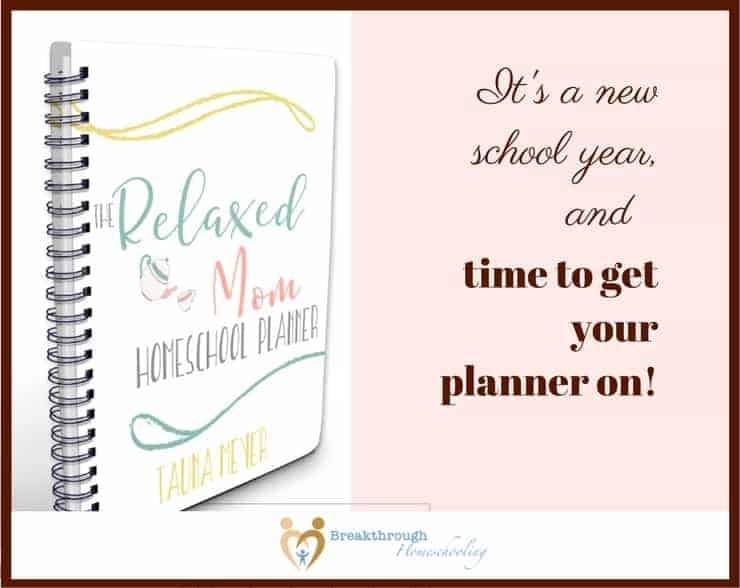 Who’s the Relaxed Mom Homeschool Planner For? While the title says “Relaxed…” don’t be fooled! That doesn’t mean that this encourages willy-nilly methodology, little prep or virtually no reporting! In our early years of homeschooling, when I would ‘explain’ to my husband that we were being flexible, he would respond with “How can you be flexible if you have nothing planned to be flexible from?” Ouch…but a good question. What Mrs. Meyer has done here has encouraged and enabled homeschoolers to put in the necessary thought and planning that it takes to be flexible and confident and relaxed as they homeschool. With a solid foundation and approach in hand, it will be easy to work with your child’s interests and delights throughout the year…no matter what twists and turns develop! This is a great resource for those looking for a non-fluffy paper and pen planner that doubles as a valuable homeschool resource. So order yours TODAY…and then come back in a few days and let us know what you think in the comments! !